Tegalalang Rice Terrace is one of the famous tourist objects in Bali situated in Tegalalang Village north of Ubud Bali featured by the amazing rice terrace set the cliff. Tegalalang Village is located on 600 m above sea levels covered by good temperature where most of the villagers as a farmer. It offers the stunning view of rice terrace where we can see from the main road from Kintamani to Ubud. 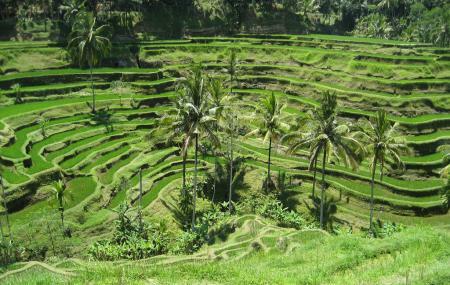 A day in Bali is incomplete without adding Tegalalang Rice Terrace in Bali trip planner. The early you visit the place, the better view you get. Restaurants and café: 9am – 6pm. How popular is Tegalalang Rice Terrace? People normally club together Lemukih Waterfalls and Tirta Empul while planning their visit to Tegalalang Rice Terrace.